“Cory, you always say, ‘Listen to the kids,’” joked Louisiana Congressman Cedric Richmond, who prompted the students packed into Xavier University’s Convocation Center to put Booker’s possible White House aspirations front and center. 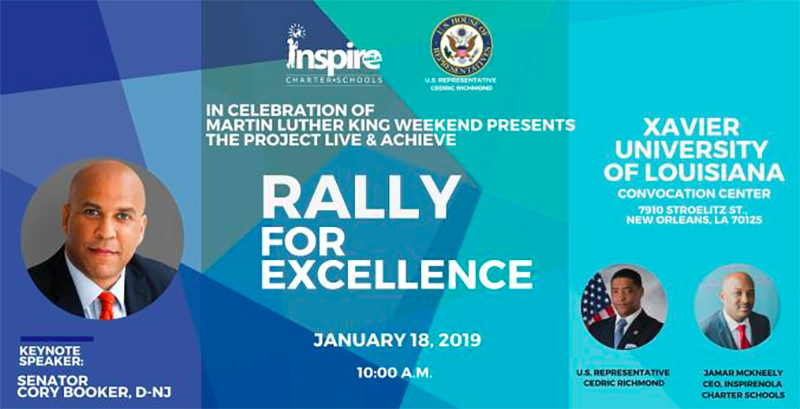 The event was a “Rally for Excellence” hosted by InspireNOLA Charter Schools and Democrats for Education Reform. Booker acting as the headliner while also contemplating a run for the Democratic nomination stands out at a time when other 2020 Democratic contenders have distanced themselves from charter schools or school choice while embracing teachers unions, who see charter schools as a threat. The 49-year-old Democratic standout, who could be facing newer rising stars in his party, including the already-declared U.S. Sen. Kamala Harris, spoke to the students about the importance of civic engagement and the need to fight societal injustice. Booker went on to tell the story of how his father rose above his impoverished upbringing in rural North Carolina to become one of IBM’s top salesmen, all the while battling racial and economic barriers that still exist today. When his parents first moved to New Jersey, Booker recounted, they tried to buy a home in a traditionally white neighborhood, but real estate agents refused to sell to a black couple. His father eventually fought back by participating in an undercover sting operation with a local fair-housing group that exposed those discriminatory practices and allowed his parents to buy the home he grew up in. “We still live in a country where the power of the people is greater than the people in power,” he said. Booker’s address capped a series of speeches and student performances held in honor of the Martin Luther King Jr. holiday that was organized as part of “Project Live & Achieve,” an initiative of InspireNOLA and New Orleans community groups to promote nonviolence, academic success, and community service among the city’s youth. Booker, who has not said whether he will run, was surrounded afterward by throngs of students eager for high fives and selfies. “Hopefully students come away inspired to make a difference in their own communities,” she added.